We thoroughly enjoyed Central America. Sometimes culture shock hit us hard and and other times we were amazed by the natural beauty. We had a great old time and thank Guatemala, Nicaragua, Costa Rica and Panama for their kind hospitality. Wish we could have stayed longer. Below, in reverse chronological order, are our notes on Central America. Panama is the gem of central America. Undiscovered, much of it remote and untouched by modern civilization, we have been delighted with our explorations of Panama. 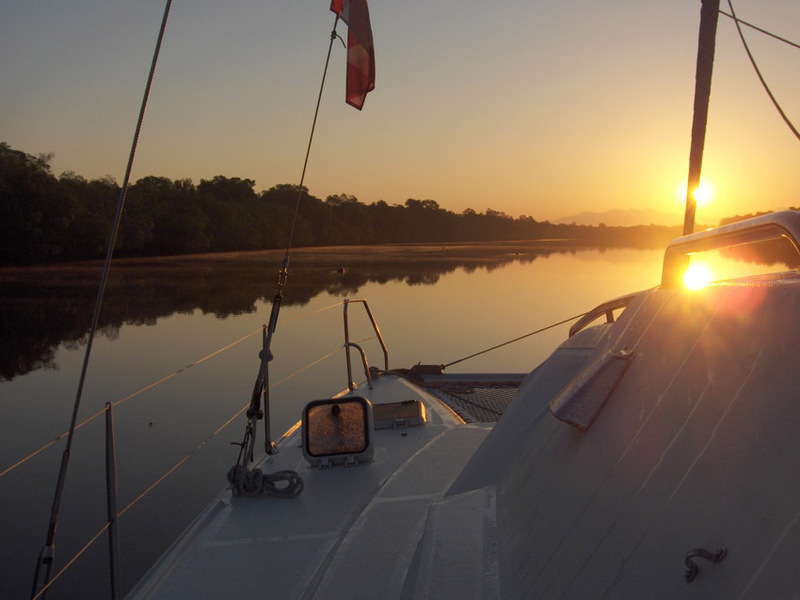 Did you know, Panama is the only place on the continent where you can see the sun rise over the Pacific? Although Panama's cities can be a bit gritty and downright dangerous in places, Panama as a whole is a delight. 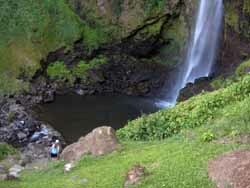 Low cost, friendly people, many remote unsettled locations and lots of cool places to hang out. And it is the best place to work on your boat since San Diego. First there are the Islands, the sparkling gleaming islands dotting the seascape as you journey deep into Panama. 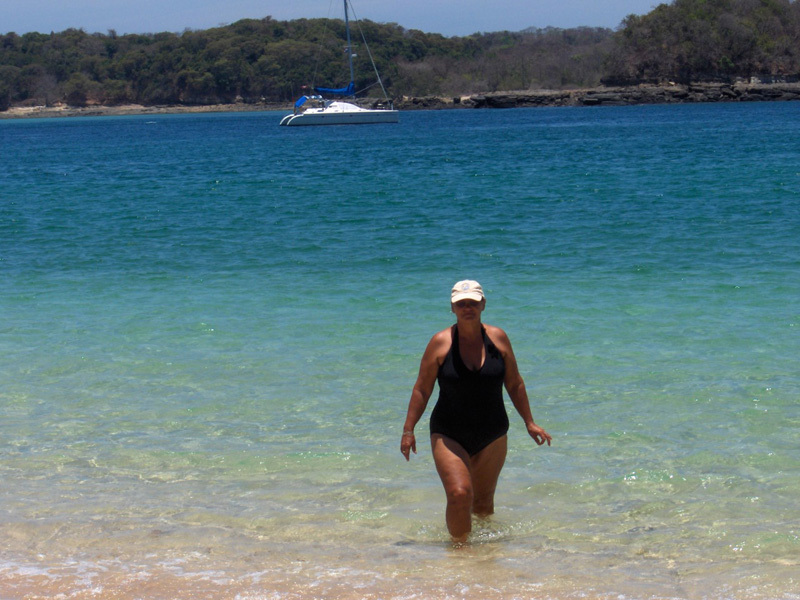 Isla Seca's crystal clear waters and golden beaches are brilliant. It is an exquisite location where thousands of tropical fish, flash through the waters, with occasional turtles and a rare shark. The water is so clear that your vision tells you the water is only a few feet deep, but the depth sounder reads 25-40 feet. Click the picture at the left to view one of these picturesque islands or click here for a slide show. 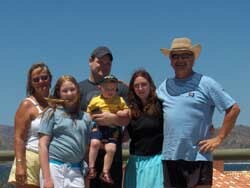 Bahia Honda was another paradise, this one populated by friendly locals who showed us their idyllic way of life. Little money or things to spend it on, ample food for the picking. No cars and no roads as we know them. It was amazing. Click here to see. Then there is Las Perlas (The Pearls). 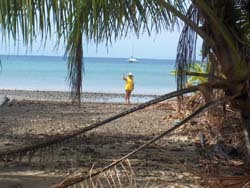 Dozens of picture perfect tropical islands just 40 miles away from the very cosmopolitan Panama City! 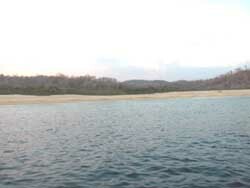 A couple of the islands, Chapera and Mogo Mogo are where the TV show Survivor Panama was filmed. They were very beautiful. Click here to see some of Panama's pearls. 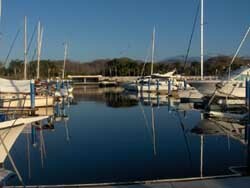 After enjoying the islands we did five days hard labor in the Panama heat at the Flamingo Marina. We hauled the boat out of the water and carried out our annual maintenance. Gasp! The heat! The humidity! Sweating like never before in our lives. Huge balls of sweat from every pour on our bodies, sweating from the eye lids, sweating our chins. Our shirts and pants constantly soaked. Click here to see what a fun time we had. But the hard labor is done and we are back in the water. Mustang Sally is looking spiff, leaks plugged, rudder delam-fixed, props cleaned and re-zinced, leg oil changed, exterior polished and waxed, and the bottom painted. 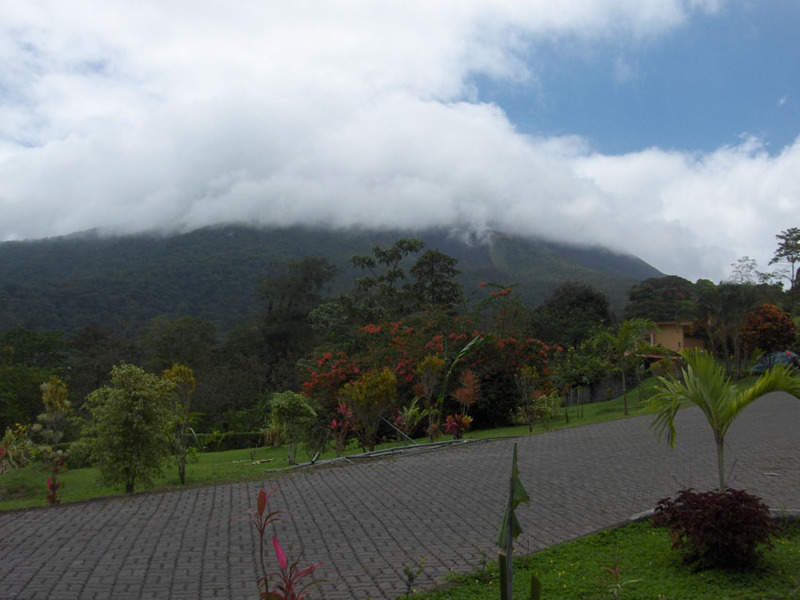 Ready for the Ecuador trip? Not quite. We need a couple of weeks to chase down the other things we need for the South America and the South Pacific. Oh yeah, we also have to explore Panama City and relax. We are moored at the Balboa Yacht Club. What fun watching all the boat traffic! It seems I have only a few pictures of Panama City. Click here to see them. What would a visit to Panama be without a trip to the canal. What the hell, why not trough the canal. 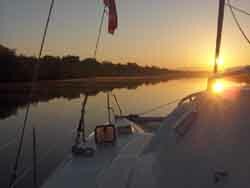 We joined Tod and Jenn on their 44 foot Columbia for a trip through the canal. Our hosts were very generous and made sure we had a great time transiting the canal. We had a blast! Click here to see some of the fun. 2) Unlike other Central American countries, the United States government mostly kept out of Costa Rican politics. 5) The population is largely Spanish decent where other Central American nations are primarily Metizmo and native. All these things combined with a abundance of natural beauty make Costa Rica an extraordinary place. 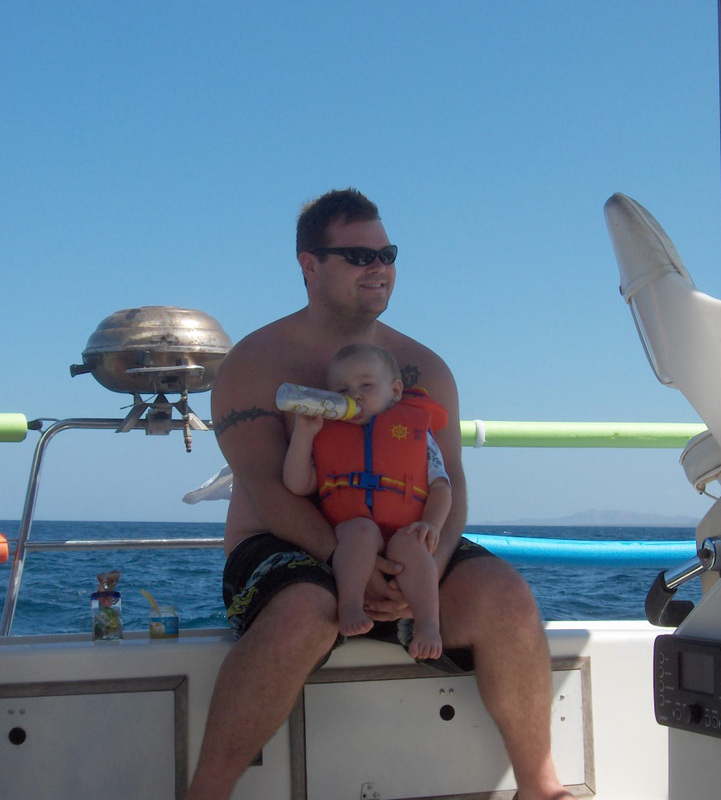 It was a sailing adventure getting to Costa Rica. A local weather condition called Popagyo winds blasted us with 25-35 knots of head winds for three days and nights. These hot gusty winds are powered by high pressure systems driving the Caribbean trade winds into the Central American continent, over the mountain ranges and into the Pacific. Our tactics for dealing with these highly unpredictable winds was to sail close to shore where minimum fetch keeps the waves small and easy to deal with. For most of the three days we sailed double or triple reefed, close reaching on long south easterly tacks, interspersed with short north easterly tacks to bring us back in close proximity to the coast. What is the difference between adventure and terror? - Attitude! So what did we see in Costa Rica - my blue eyed sons? What did we see there my lovely young ones? We saw waterfalls and a volcanoe that was not a smoking. We saw wonderous rain forests on the top of Monte Verde. We rode zip lines and swings right through the forest. We swam in warm water bays where the surfing was easy. We saw a mafia marina and a blow laden town Where the long legged ladies laboured late in the night. We saw tropical gardens and scarlet winged butterflies. Humming birds hovering, don't forget the howler monkeys. We saw roads so bad they would bust up your axles. 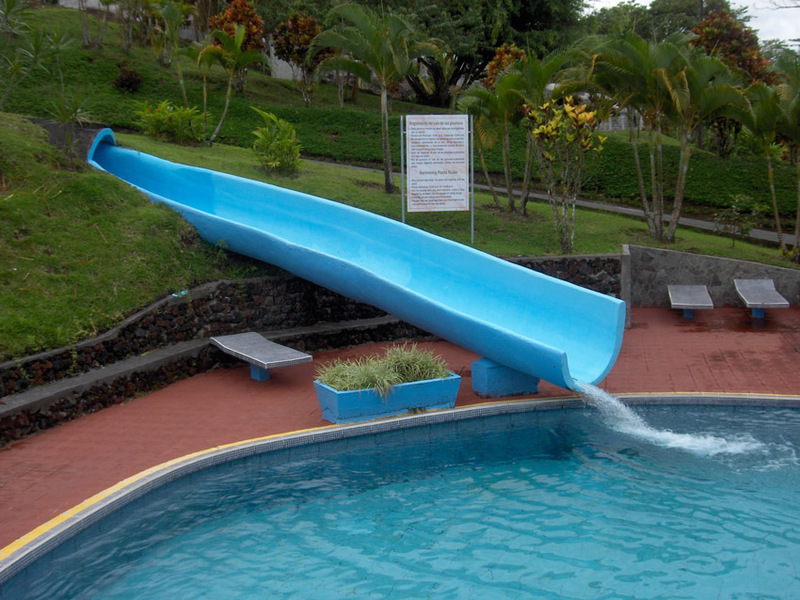 We lounged in the comforts of exotic resorts, and rode concrete water slides down to the water. Where we swam and we swam until we could swim no more. But best of all, yes best of all, Josh, Harper, Thea and Justin joined us for an action packed two weeks of adventure in Costa Rica. We took big bites of Costa Rica. It was very good. 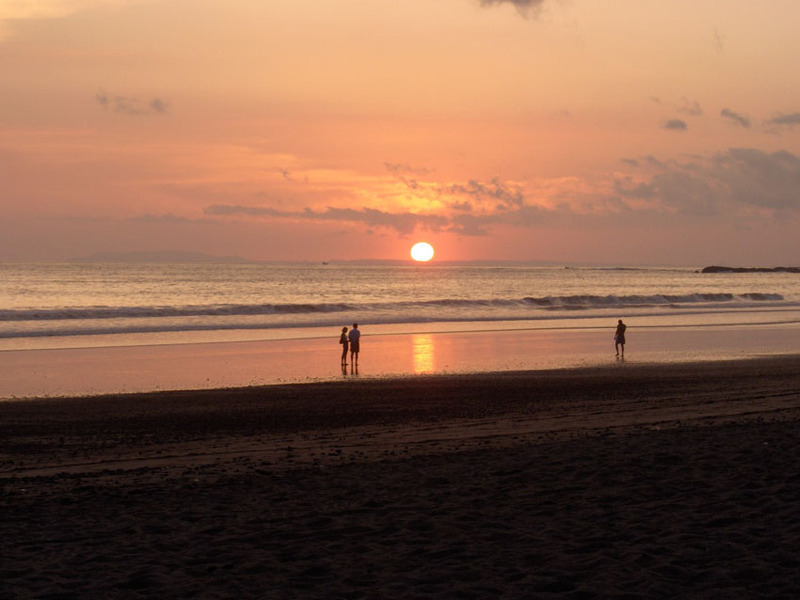 We were looking forward to visiting Bahia del Sol in El Salvador. A Vancouver couple from our offshore sailing club - the Blue Water Cruising Association operates a marina there. From most reports it is a great place to visit. However, we were forewarned about its tricky entrance. It has a challenging marine bar. 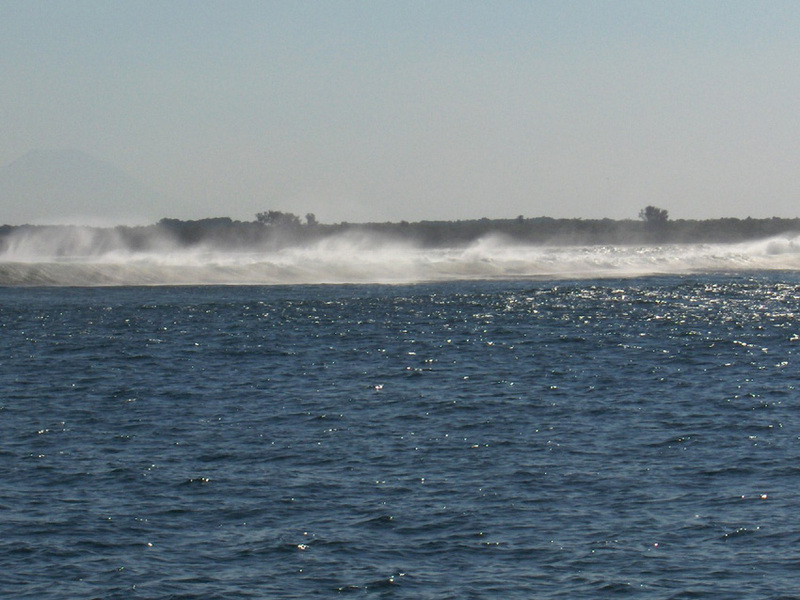 A marine bar is an area of rough water that blocks the entrance. The bar was extremely rough the day we arrived. Click the picture at the left to see the waves breaking over the entrance. So we had to push on another 20 miles to our alternative achorage Barillas. The rought bar at Bahia del Sol was a blessing, because Barillas was a delight. 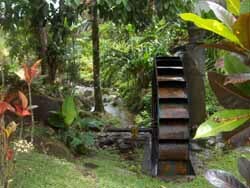 Barillas turned out to be a resort for the rich and famous of El Salvador. It was a virtual paradise. 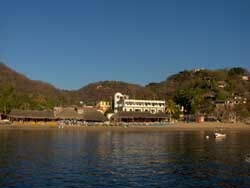 What we saw of the rest of El Salvador confirmed that we were in one of the finest marine resorts in the country. 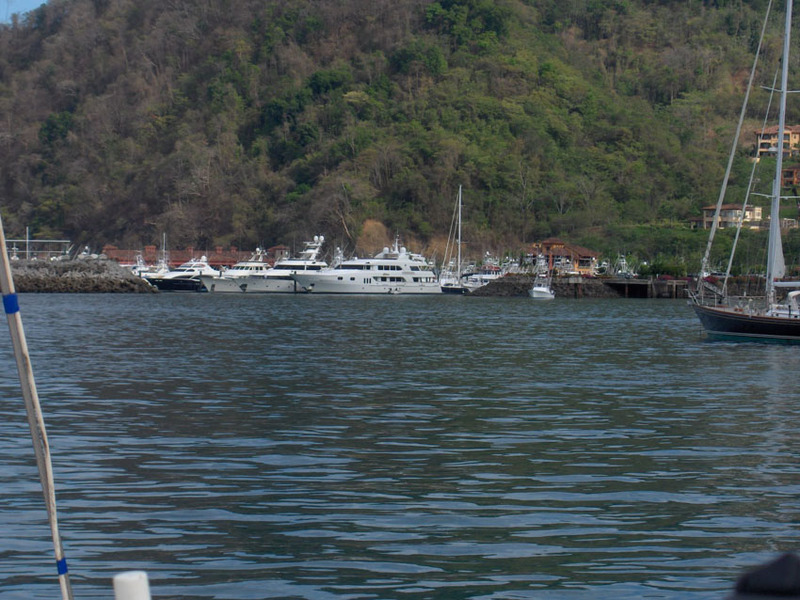 According to a local news report, the president of El Salvador frequents the resort and often talks to visiting yachtsmen in such an informal way that most don't realize who they are conversing with. We did meet such a man and perhaps he was the President. One of the resort staff reported that the President was staying at the resort. Regardless, the resort was brilliant. And the song birds filled the air with exhotic tropical sounds. Several sounded like a common cell phone ring! 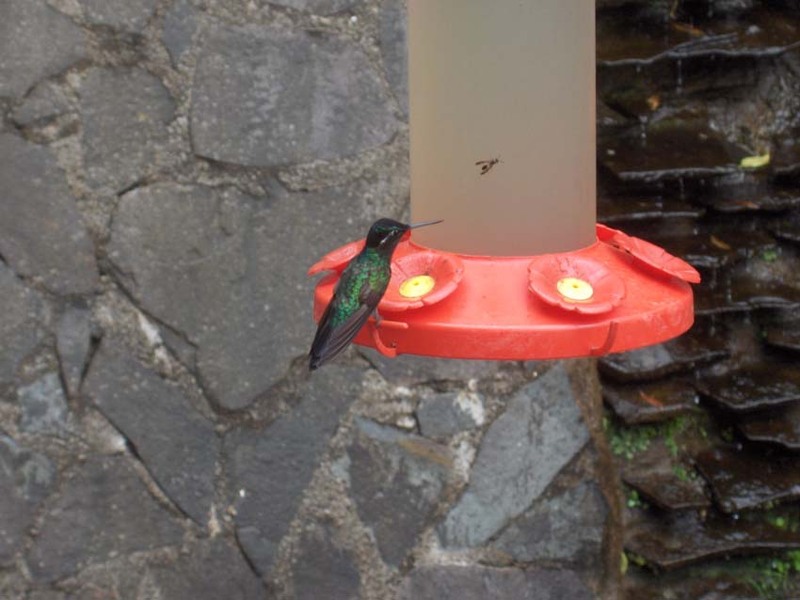 Click here to hear the birds and view some sites from El Salvador and Barillas. After months in Mexico we were unprepared for the abrupt change in living conditions. 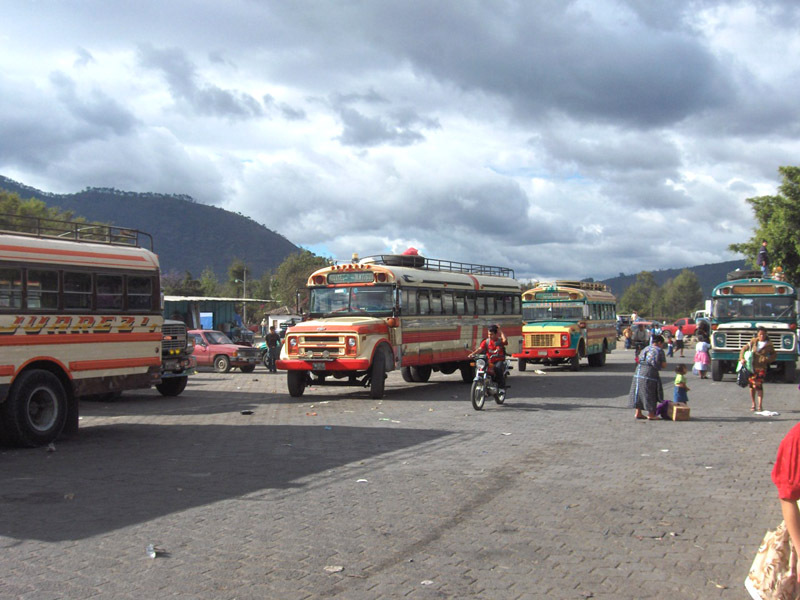 Guatemala shocked us with its towns overflowing with people, multitudes of businesses overflowing in the streets, sardine can buses and beautiful mountains. 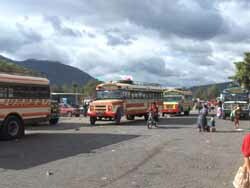 We landed in Puerto Quetzal, then traveled inland by chicken bus to Antigua. 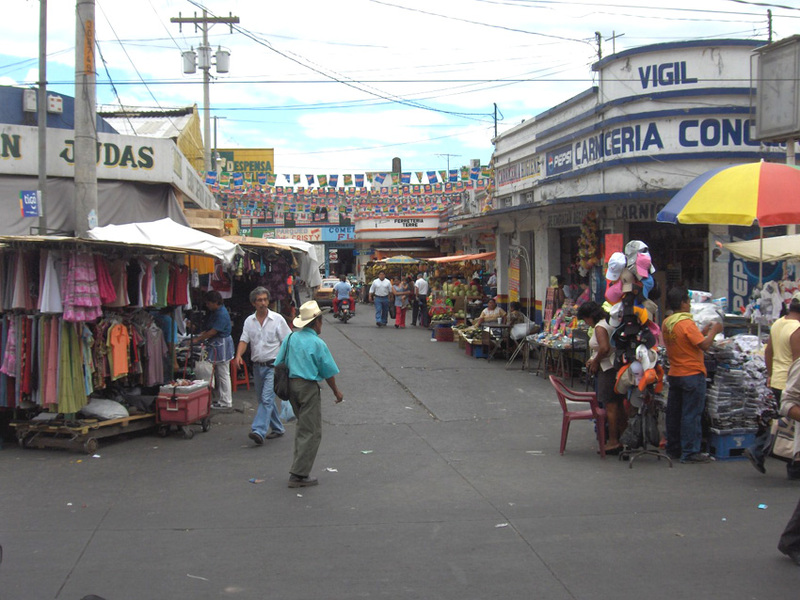 Antigua is the old capital of the Guatemalan Empire, which bound most of Central America under Spanish influence. Click here for a picture tour of Antigua. Chicken buses. These owner operator buses move people all over Central and Southern America. The owners often decorate them with festive paintings and/or neon lites. Because revenues depend upon picking up customers, the owner work hard, stopping everywhere and whistling and honking to attacked the attention of potential customers. With a chicken bus, there is always room for another customers. Packed in like sardines, we sat on seats build for two with as many as five adults and children packed in. On one bus the ticket taker had to walk on the backs of the seats to collect fares. The name chicken bus applies in three ways. The drivers play chicken with each other, the customers are known for bringing their chickens aboard, and some of the buses look so bad, you may be playing chicken to ride them. View a short chicken bus pictorial by clicking here. First they have the normal shops you would expect to see in any town. 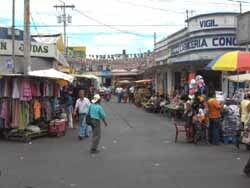 Second, in front of the shops, vendors come in and put up make shift stalls, usually with a table to display their wares and a roof. Third, in front of the make shift stalls, more merchants, spread their rugs to display goods for sale and sit almost under the tables. 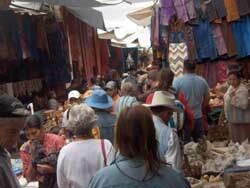 Fourth, more vendors pile their wares on their shoulders or on their heads and walk around selling things. Fifth, on the corners where there is the most traffic, more merchants will spread their wares on the ground, and get indignant if you stop on their goods. Sixth, after you have bought all you need, you find distributors on the side side streets, who will sell you the same thing at 1/2 the price. Wow what a place. I don't think I would go back, but it Chichicastenango has to be seen to be believed. Click here to see our rather paltry collection of photos. The anticipation, the waiting and the watching the weather before hand sure built up the tension for crossing the challenging and often stormy Gulf of Tehauntepec in southern Mexico. We hung out at the Haultco marina for a few days and watched the weather and discussed strategies for crossing this difficult piece of water. 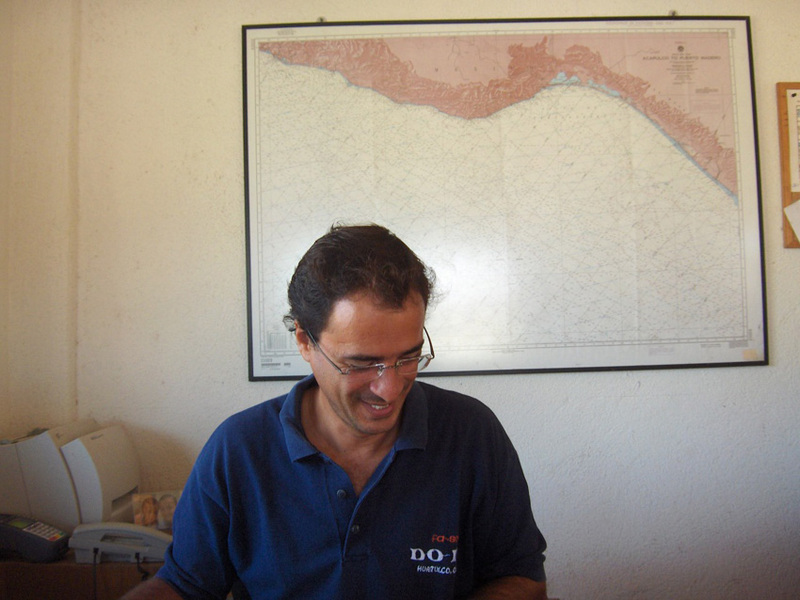 Enrique, pictured to the right has seen hundreds of boats cross the Tehauntepec and rescued a few. Three boats were lost in the month preceding our crossing. 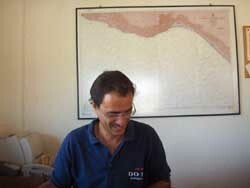 That is a chart of the Tehauntepec on the wall behind him. We followed his advise. Our weather window came a day early and we jumped through pronto. The plan was to sail close to shore, up to latitude 16 then hang a right and dash across, then south east down the other coast. That minimizes risk in the event the weather changes to nasty. We had light reaching winds and sailed under spinnaker until dark. At dusk we tucked in the obligatory night time reef and dumped the chute. We light up the diesels to maintain 5 knots in a failing breeze. About 3 hours after dark, I hear the sea running. Current - like we hear in the Straights of Georgia. Sally slows to about 4.5 knots and I figure the current is from the large lagoon at the head of the gulf dumping water with the falling tide. An hour later the depth sounder shows 20 feet. Shite! 10 feet - 8 feet. Triple SHITE! Reverse engines, swing the boat around and retreat back up Sally's track. Depth goes - 10', 20' 40' 100' - we are out of trouble and OK. I double check position. We are in a shipping lane for heaven sake! 100 feet of water shown on the chart!! Now the charts of Mexico are not that accurate, but this would seem to be an impossibly gross error. We must have sailed over a whale or something to trigger the depth sounder incorrectly. Back to course. Depth goes 50', 40', 30' 10' 5'. Holly CRAP!!. Reverse again and retreat back down the course line. This time we turn right and run down lat 15.87 instead of 16. No more depth problems. What could have been the problem? Whale? Huge school of fish? Submarine? Does Mexico have subs? I don't know. As we approached longitude 095 - about 10 miles away, winds pipe up to 20-25 range and stay that way until about 40 miles the other side. More reaching weather - yaahooo :-) 7-8 knots with white sails and a reefed main. Rolled in the jenny a couple of times to keep boat speed under 8 and minimize pounding. Then we turn right and reach south east down Mexico's south west coast on the east side of the Gulf. Blue chute pulling like a freight train. Contrary current gone. 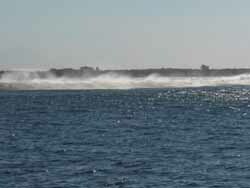 Speed in low eights, flat seas and 12 knots of breeze. 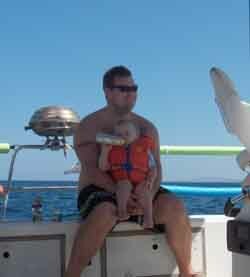 We crossed the Gulf of Tahauntepec. Fine fine sailing weather. 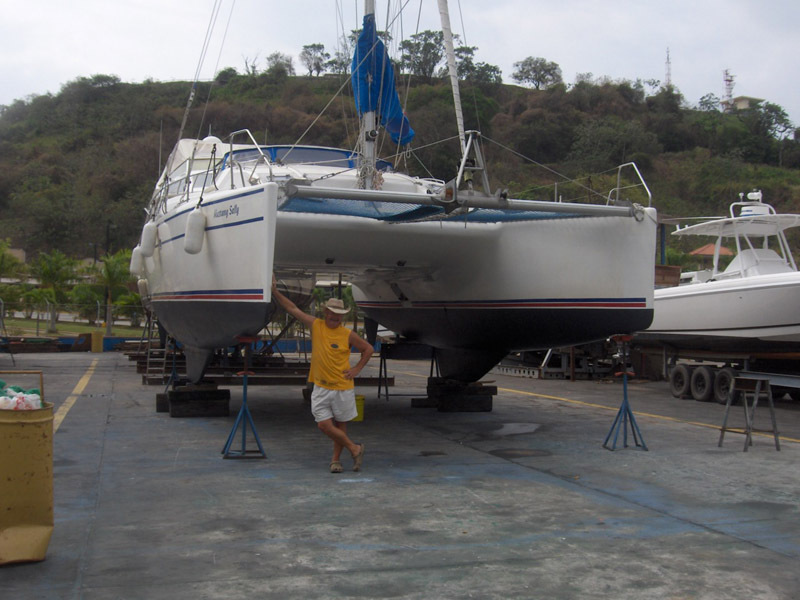 A weekly chore on a sailing boat in the tropics is cleaning the bottom of the boat. The problem is that a dirty bottom slows the boat. The growth of a multitude of sea creatures adds resistance to the boat sliding through the water. Speeds are slower and fuel consumption goes up. It looks bad too. The tenacity of the sea creatures that make there home on the bottom of Mustang Sally is amazing. The pink barnacles move in first. They grab hold of an area and stake a claim. Having established ownership, the barnacles sub divide and auction off properties to new families of barnacles, crabs, shrimp and other creatures. These creatures are tiny. Without a microscope you have to examine the creatures close up and look hard to discern their tiny features. Tiny claws on a creature smaller than a crumb of bread. After a few days, whole communities of these tiny creatures participate and soon a booming eco-system is running rampant on the bottom of the boat. The population swells to thousands and tens of thousands. Then along comes the grin reaper. With a stoke of my squeegee I wipe out whole neibourhoods. The residents flee to the water. The water is thick with their presence and it is necessary to alternate sides and work from front to back to avoid being immersed in a veritable sea of the sea creatures. But some find a new home. On the grim reaper - me. They don't seem to mind where they live. Most wash off easily with soap. But a few of the enterprising creatures find an orifice in which to ensconce them selves. How would you like a crab or a shrimp living in your ear? Yeeetch. Wiggling and squiggling, tickling my eardrum. We chased them out with rubbing alcohol. 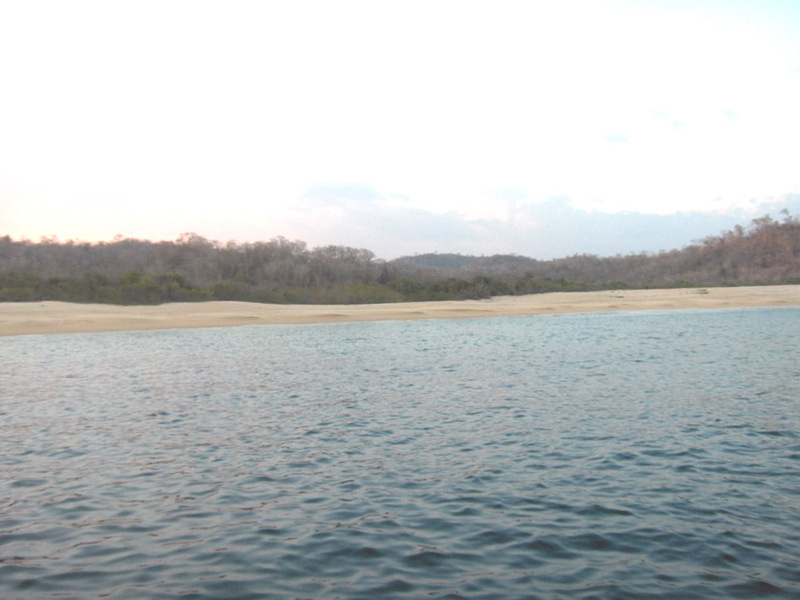 A beautiful national park in southern Mexico. The full name is Bahias de Hautulco. There is no town or city of Hautulco. Just the old town of Santa Cruz and the recently built tourist town. 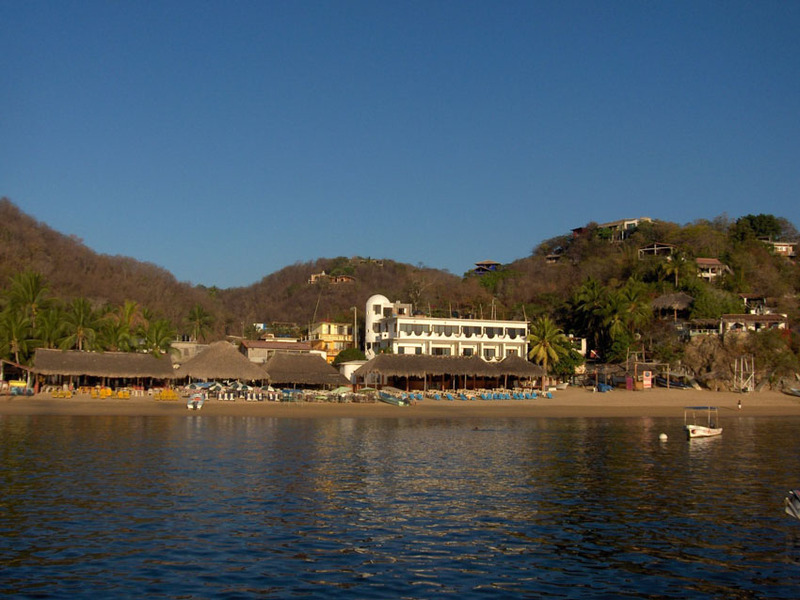 The tourist town feels just like Ixtapa to the north. Very perfect. Really really perfect. Just too damn perfect for me. No raw edges anywhere! Everything arranged in an or so organized manner. The town designers creativity must have been exhausted after Ixtapa. But the Bahias (the bays)! 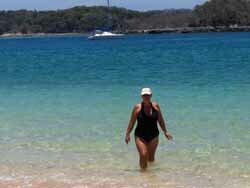 Beautiful, remote, un-populated bays with cool clear water, coral reefs and miles of white sand. The diving was great. As the Mexicans say - mucho tranquilo. Marina Chahui east of Santa Cruz was the finest in all of southern Mexico. Ah Puerto Angel, what a gem of a place. 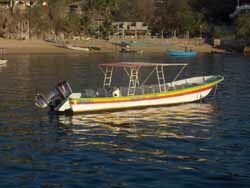 Just the right size, a small bay with crystal clear waters filled with fish and a town of maybe a few thousand souls. Not crowded with gringo's trying to party hard for a week or so before returning to their regular lives and responsibilities. Just the right number of restaurants on the beach. Splashes of color abound. Bougainvillea and brightly painted houses. 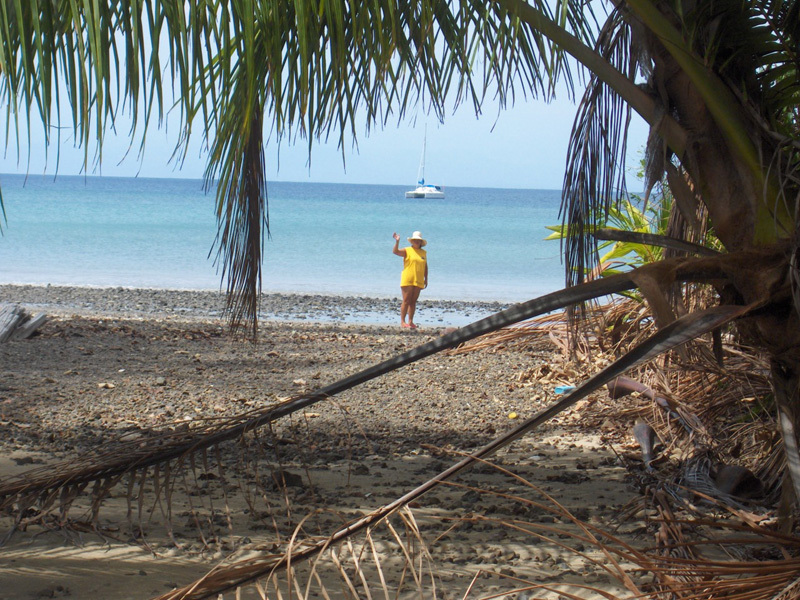 And we loved the way the Puerto Angel fishermen parked their pangas. (a panga is an open boat like the one at the right). Click here to see how they park!